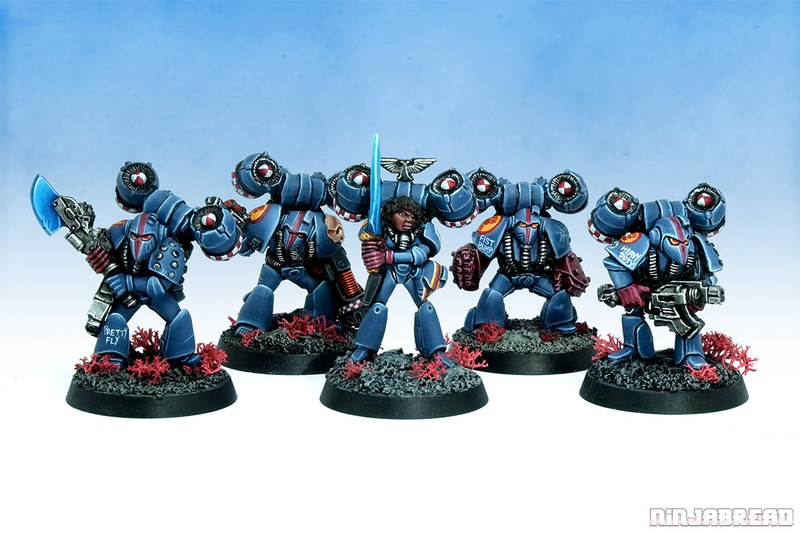 With Space Marine players jumping for joy that the new Primaris miniatures get jump heavy weapons, I've jumped at the chance to do a Rogue Trader era squad – when jump heavy weapons were also a thing. I regret not thinking of "JUMP THE GUN" as the armour graffiti for the squaddie with Heavy Bolter. Stamped out in Warhammer 40,000's second edition, and now only just reappearing 26 years later – Space Marines with heavy weapons could also select jump packs in a number of ways in the various army lists. 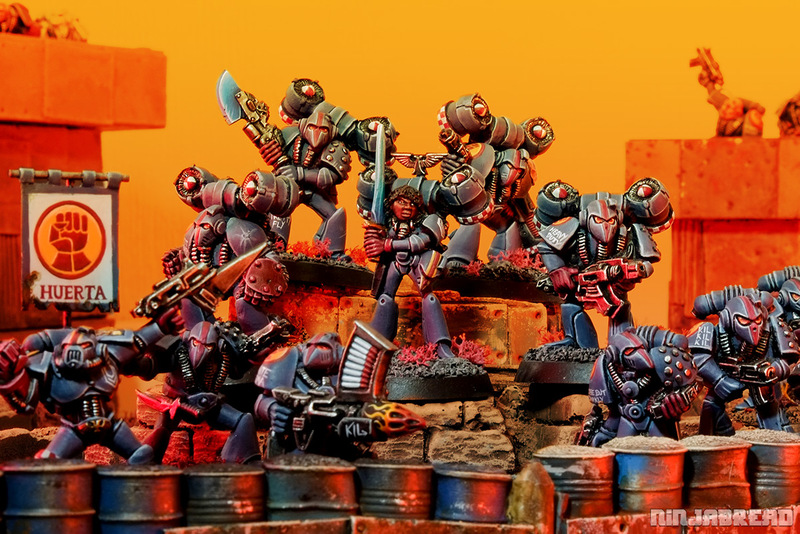 Squad Taurasi have done it here by being a Tactical Squad upgraded to "Cobra Squad" status in the 1988 Book of the Astronomican army list – and the highly mobile lad on the far right is toting a Heavy Bolter. Sergeant Taurasi's graffiti reads "I SAY JUMP" and "U SAY HOW HI", showing she's the lady charge. 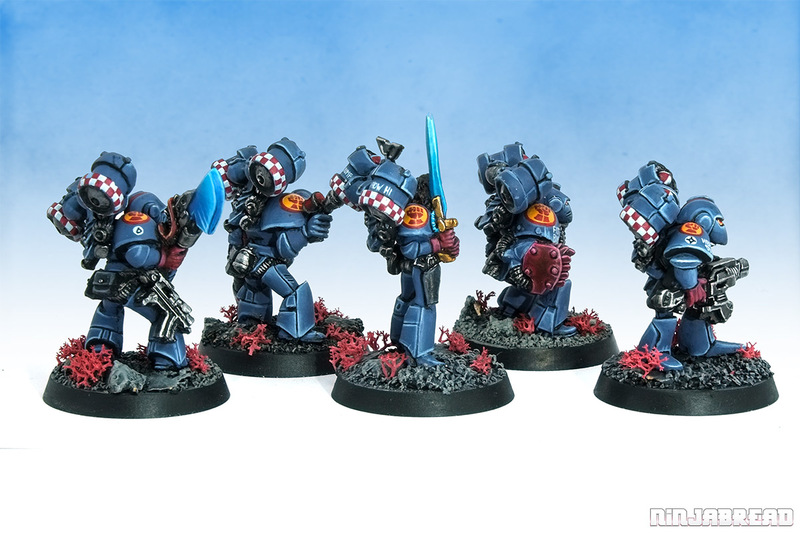 I had a lot of fun painting checks on the jump packs, to give the squad some visual interest, and distract from the assymetrically lumpen sculpting of these vintage Marine miniatures. This design of jump pack commands a high price on the collector's market and is frequently pirated, meaning it's taken years of patient hunting to source five genuine castings – so they're worth lavishing the paitning time on. Sergeant Taurasi is not actually a Space Marine miniature, but "Female Warrior Jayne" from the RT601 Adventurers range, meaning this blog counts as part of the Choose Your Own Adventurers series I've been doing with cheet0r and axiom. Recently, cheet0r has incorporated some of the Adventurer Cyborgs into his Necron army, and axiom has turned an Adventurer Pilot into a Buck Rogers homage – check 'em out! To spin Female Warrior Jayne as a sergeant she's received a thigh-mounted helmet with rank stripe markings, and an an Imperial Eagle command trinket (in lieu of an unaerodynamic back banner) on her jump pack. 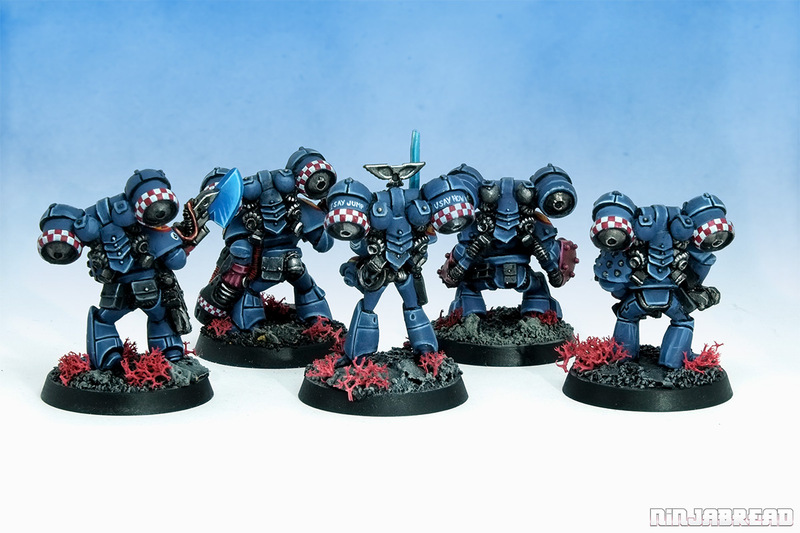 Squad Taurasi reinforcing the Crimson Fists battleline. Fort and towers coming soon from Fogou Models. Squad Taurasi pushes my Crimson Fists force pleasantly closer to the initial 1000 points goal. 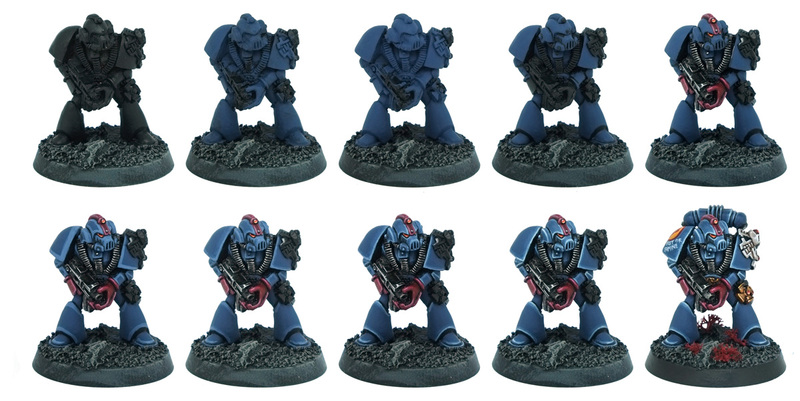 If you'd like to learn how I paint Crimson Fists, I've photographed a Marine in between each step of the blue power armour process. These steps broken down, with the techniques and theory behind them spelt out, the tutorial is available on Patreon. The skills you'll learn are transferable to all colours of power armour. The back catalogue of tutorials also covers white armour and brass armour – and will continue to expand every month. Coming soon – some vehicles and support characters to round out this vintage Rogue Trader force. I've been painting a Missile Armour Dreadnought on the twitch, and also powering through the original metal Land Speeder, and collecting the glorious classic Techmarines. Stay tuned! Thank you for the step-by-step images. The group look great. I do like those old-school Turbofan jump packs!